Authors note: thanks to everyone for your messages of support; no words to tell you how much they helped, and sorry I did not respond to each one of them. Today, is, thankfully, MUCH better, and I guess the saying about a good cry making you feel better is true! I wrote this poem yesterday, in the depths of my sorrow and anguish, and initially was not going to post it here, but in fairness to the reality of living with a dementia, which is that you cannot possibly live well with it all the time, it seemed unreasonable not to publish it here. Came home from spending day with mum at her ‘new’ home…..read your poem and couldn’t keep from crying myself. Thank you , thank you, thank you. I am really looking forward to reading your book. Not long to go now! Such a beautifully written poem. Heartfelt. You are a remarkable lady with so much strength. One is allowed to let go of your feelings in order to regain control. Enjoy your postings… You are inspiring and encouraging. Thank you!! A beautiful piece. Writing does help! And then make the next plan. I like that. 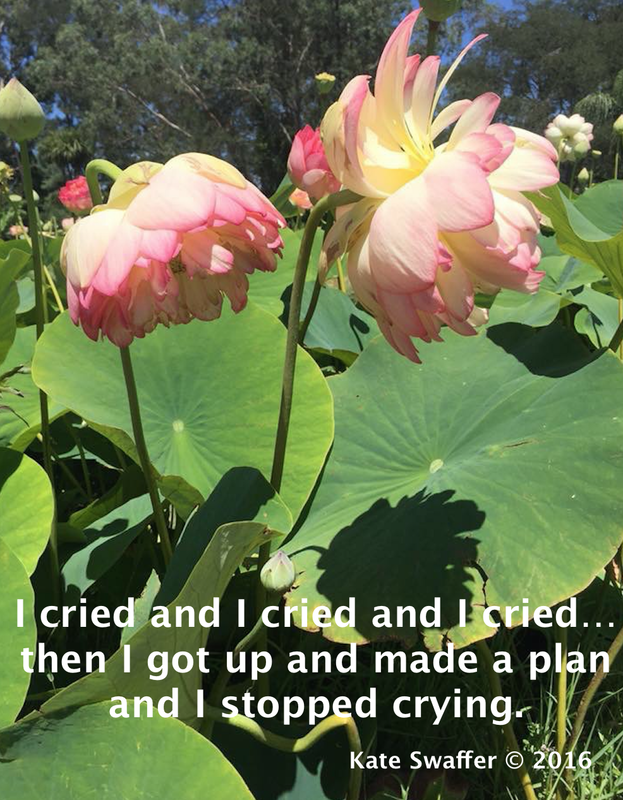 I cry too and I plan and then I cry again but I know there will be another plan! Love you Kate! I hope this means that you’re feeling a bit better today Kate … vert glad ….. would a holiday to do things purely for pleasure be something you’d enjoy? For example, a holiday to Venice or Paris etc. Sending you healing hugs …. This poem comes from kateswaffer.com from her blog entitled, ‘Creating life with words:inspiration, love, and truth.’ I read it on one of her friend’s website’s, whom is also struggling with similar problems with family members. I ask her if I could reblog it and she sent me to the source. I cried too this week Kate – I cried because both my mum and dad are not with me any longer, have not seen my daughter grow up, and just because I miss the two people who gave me life. I miss them every single day, and more so this time of the year as this is when mum died in my arms. I cry for the loss of a friend last month at the age of 34, who will never have the privilege of growing old. I cried secretly and not for long, because I am in so much pain every minute of every day and am at the stage where the exhaustion and debility sometimes does my head in. But I cry too because it will be over very soon and so happy tears mingle with the sad. Then I tell myself to harden the f**ck up Princess, and put my tough girl boots on and kick through it – because there is always those much worse off than us. We have a life many would envy. We have not seen our families slaughtered in front of us. We have a roof over our head and food on our table. We have both arms and legs, or our sight and hearing. We are not wheelchair bound – well I am almost. Lol. We have blue skies and the smiles of our children. We have hugs and love and joy. We all must cry but we all must allow the crying to release our fears so that in the outpourings we can actually see through those tears to the amazing journey we have been given and that, despite hardship and pain, we have been given a precious gift. Smile – it uses much less muscles than crying. Big hugs to you Kate and I do hope that your beautiful smile is today your inspiration. Continue to sparkle my friend. We do cry together, for each other, with others and for others – to have the ability allows us empathy and compassion always my lovely Kate. Big hugs Kate and I hope the next few days get even better. Gosh I’m looking forward to seeing this ‘keep going’ plan in action, because the little that I know of you makes me think that it won’t stop there. It is difficult to read your post without howling myself. Thank goodness my friend Dominique introduced me to you.